I suspect this is one for the YouView content team . It is apparent that the timings in the YouView EPG for the Disney Channel (480) differ from those published by that channel on their own website. For example on Friday morning 5 Jan Disney lists Raven's Home starting at 7:29am whereas YouView EPG say 7:30am , other examples are Bunk'd at 8:31am (Disney) and 8:30am (YouView) , Hotel Transylvania at 9;02am (Disney) , 9:00 am YouView , Miraculous Tales of Ladybug at 9;17am (Disney) , 9:15 am (YouView) , Tangl'd at 9:48 am (Disney) , 9:50am (YouView). 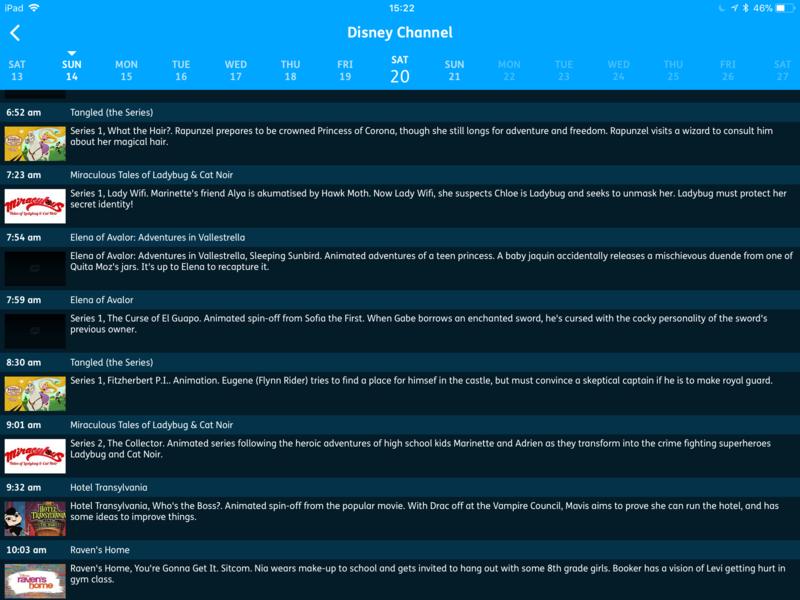 I also had a look on the BTTV app where the schedule appear to be consistent with Disney Uk own. Have you tried recording any programmes on this channel and found that the start or end were clipped by a 1-3 minutes due to the time difference? It'd be helpful for our Content team to know, especially if you have any examples of programmes where this has been a problem before going forward so we can find out if it's an error on our end or theirs. I would have thought this may in part relate to the fact that the traditional/Freeview/Youview EPG appears to have a 5 minute granularity (i.e. nothing is ever listed as starting or stopping off of such 5 minute increments), unless that has changed or just appears to be the case but that the data could provide more exact times but just never does. This was something @zulu17 remarked on almost 4 years ago, making further reference back to the famous Shaun the Sheep testing thread (which has some illuminating posts from Piers as to how AR works/is implemented to work by YouView). In practice programmes do not exactly fit that granularity (but ad breaks and the exact point the channel chooses to mark the now/next boundary effectively interacts with this - be the now/next point at at the start of the ads, the end or perhaps more helpfully in the middle to provide pseudo padding at both ends of recordings) and if AR were fully implemented and working for all channels then it would not matter. If the standard Freeview data plus extra data provided for the IPTV channels in the YouView EPG is still only managed at a 5 minute granularity then issues are more likely to arise relating to shorter programmes (which may more often be children's programmes or short news updates) or where channels tend to play quite fast and loose with the line up of programmes and ad breaks around the 5 minute granularity and do not provide full AR. I did schedule a few programmes and have had a chance to view them. When the Youview schedule had an EPG start time later than Disney’s own guide there is regular truncation of recording at the beginning. earlier than Disney’s own guide I did not notice any truncation of the recording probably due the generous advert and trailer breaks on the channel. The schedules for the Disney channel this Friday evening as shown in the Youview EPG vary significantly to the actual broadcast schedule. i attach a Youview App EPG view for the channel and Disney’s own view. @Keith As far as I can see with effect from next Saturday we now have YouView EPG data for the Disney channel which appears to give EPG start times to the nearest minute rather than what appeared to be the nearest 5 minutes. It'd be interesting to know if the changes to the YV EPG from tomorrow onwards resolves the issue of clipped recordings, particularly to the start of the shows. If you are able to test a few and report back it'd be very useful. In terms of the guides showing different content for the same channel and the same day, it'd be good to know if this has happened again since, particularly if there's some disparity between the YV and Disney guides for later on today or at the weekend as we can enquire about these.